Getting enough fiber is important for your health. For one, it can reduce constipation and help with weight loss and maintenance. It may also lower cholesterol levels, as well as your risk of diabetes and heart disease. This may be because fiber is a prebiotic, meaning it promotes healthy gut bacteria. Yet most people aren’t getting enough fiber. The Institute of Medicine recommends 38 grams per day for men and 25 grams for women. Americans average only around 16 grams of fiber per day, which is about half of the recommended amount (1). These are 16 ways you can add more fiber to your diet. Fiber is a type of carb found in plant-based foods. While most carbs break down into sugar, fiber stays intact as it passes through your digestive system. Eating fiber along with other carbs helps you feel fuller for longer. It also slows the time it takes digestible carbs to be absorbed into your bloodstream. That helps regulate your blood sugar levels. Whole-food carb sources all naturally contain fiber. These include fruits, starchy vegetables, legumes and whole grains. Bottom Line: Choosing whole foods ensures you get carbs that have fiber. Select a variety of beans, whole grains, fruits and vegetables. For a number of reasons, you should eat lots of vegetables. For one thing, they lower your risk of several chronic diseases. Nonstarchy vegetables are particularly low in calories and high in nutrients, including fiber. Eating your vegetables before a meal is a good strategy for eating more of them. In one study, women given salad before a meal ate 23% more vegetables than those served salad at the meal itself (2). Eating salad or vegetable soup before a meal has also been linked to eating fewer calories during a meal (3). Bottom Line: Eating vegetables before a meal can increase your fiber consumption. Nonstarchy vegetables are a low-calorie, high-fiber choice. 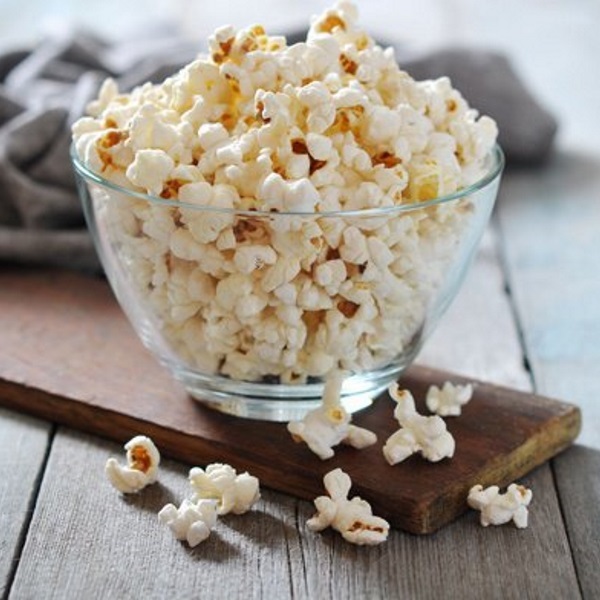 Popcorn is one of the best snack foods around. That’s because it’s actually a whole grain, delivering four grams of fiber per ounce (28 grams). That’s three cups of air-popped popcorn (4). For the healthiest popcorn, air pop it either in a brown paper bag in the microwave or in an air popper. Bottom Line: Air-popped popcorn delivers over a gram of fiber per cup. It’s a delicious snack food that’s also a healthy whole grain. Individual pieces of fruit, such as an apple or pear, make great snacks because they’re tasty and portable. All fruit delivers fiber, although some have significantly more than others. For instance, one small pear has five grams of fiber, whereas a cup of watermelon has one gram (5, 6). Berries and apples are other high-fiber fruits. The fiber from fruit can improve fullness, especially when paired with food that contains fat and/or protein, such as nut butter or cheese. Bottom Line: Fruit is an excellent snack food. High-fiber fruits include pears, apples and berries. Whole grains are minimally processed, leaving the whole grain intact. In contrast, refined grains have been stripped of their vitamin-containing germ and fiber-rich hull. This makes the grain last longer but also takes away the most nutritious parts, leaving only a fast-absorbing carb. Bottom Line: Whole grains have the germ and bran intact, making them more nutritious than refined grains. It’s best to get your nutrition, including fiber, from food. But if your fiber intake is low, you might consider taking a supplement. A few types of supplements have research to back them up. Guar fiber: As a supplement, guar fiber may improve fullness and lower your overall calorie intake. It’s also used in processed foods to improve texture (7). Psyllium: This is the key ingredient in Metamucil, a popular fiber supplement used to fight constipation. In a study, psyllium was also shown to decrease hunger between meals (8). Glucomannan: This fiber is added to some low-fat dairy products to improve texture, and it’s the main ingredient in no-calorie shirataki noodles. As a supplement, it increases fullness and reduces appetite (9). β-glucans: This type of fiber is found in oats and barley. It is fermented in the gut and acts as a prebiotic to support the healthy microorganisms that live there (10). However, supplements have two main drawbacks. First, they can cause stomach discomfort and bloating. To reduce this, introduce a fiber supplement gradually and drink plenty of water. Second, these supplements can interfere with the absorption of certain medications, so take your meds at least an hour before or 4 hours after the supplement. Bottom Line: There are several promising fiber supplements. However, you probably don’t need a supplement if you eat a range of whole plant foods. Chia seeds are nutritional powerhouses. They provide omega-3 fatty acids, protein, vitamins and minerals, as well as 11 grams of fiber per ounce (11). These small seeds gel in water and are 95% insoluble fiber. Insoluble fiber helps keep your digestive tract moving and is important for colon health. It is also linked to a lower risk of diabetes. Other forms of seeds — flax, sesame and hemp, for example — have similar nutrition profiles and are also smart choices. Bottom Line: Chia seeds deliver insoluble fiber, which promotes normal digestion and may lower your risk of diabetes. Proponents of juicing say juice — especially cold-pressed vegetable juice — is a good way to incorporate a lot of vegetables into your diet. Indeed, juice can have high amounts of micronutrients. Yet even unpasteurized, cold-pressed juices have been stripped of fiber, leaving only a concentration of carbs, specifically in the form of sugar. While vegetable juices have less sugar than fruit juices, they have far less fiber than you get from eating whole vegetables. Bottom Line: Eating fruits and vegetables in whole form, rather than juice, ensures that you get more fiber and less sugar. Avocados are incredibly nutritious fruits. The creamy, green flesh is not only rich in healthy, monounsaturated fatty acids — it’s also packed with fiber. In fact, half an avocado delivers five grams of fiber (12). Avocados have been linked to improved heart health, as well as to overall better diet quality and nutrient intake (13). You can use an avocado instead of butter, or use it to top salads and other dishes. Bottom Line: Avocados are rich in monounsaturated fats and fiber. They’re a healthy alternative to many other types of fat. Nuts and seeds provide protein, fat and fiber. An ounce of almonds has three grams of fiber. They’re also high in unsaturated fats, magnesium and vitamin E (14). What’s more, nuts and seeds are versatile foods. They’re shelf-stable and nutrient-dense, making them ideal snacks to have on hand. You can also use them in recipes to add extra nutrition and fiber to your meals. Bottom Line: Seeds and nuts provide protein, healthy fats and fiber. They’re ideal for snacking or adding to recipes. When baking, choose a flour that will add extra nutrition to muffins, breads and other baked goods. You can easily replace white flour with whole-wheat pastry flour. This fine-textured flour has three times as much fiber as white flour (15, 16). Some alternative flours are even richer in fiber. For example, an ounce of coconut flour has eleven grams of fiber, while the same amount of soy flour has five grams (17, 18). Several other non-wheat flours have three grams of fiber per ounce — the same as whole wheat flour. These include almond, hazelnut, chickpea, buckwheat and barley flours (19, 20, 21, 22). Bottom Line: Replace all-purpose flour with alternatives. These include whole-wheat flour and flours made from nuts, coconut and other whole grains. Berries with seeds are among the most fiber-rich fruits. For the most fiber, choose raspberries or blackberries at 8 grams per cup. Other good choices are strawberries (3 grams) and blueberries (4 grams) (23, 24, 25, 26). Berries also tend to have less sugar than other fruits. Add berries to cereal and salads, or pair them with yogurt for a healthy snack. Frozen and fresh berries are equally healthy. Bottom Line: Berries are among the most high-fiber, low-sugar fruits. Use them fresh or frozen. Legumes — that is, beans, dried peas and lentils — are an important part of many traditional diets. They’re very rich in fiber, as well as protein, carbs, vitamins and minerals. In fact, a cup of cooked beans can deliver up to 75% of your daily fiber needs (27). Replacing meat with legumes in a few meals per week is linked to increased life span and a decreased risk of several chronic diseases. Their positive impact on the gut microbiome may be partially responsible for these benefits (28). Use hummus and other bean dips. Add mashed or whole beans to ground beef dishes. Top salads with cooked beans or lentils. Bottom Line: Beans are highly nutritious foods that may reduce the risk of chronic disease. They provide protein and high amounts of fiber. When you peel fruits and vegetables, you often remove half the fiber. For instance, one small apple has 4 grams of fiber, but a peeled apple has only 2 grams (29, 30). Similarly, a small potato has 4 grams of fiber, two of which are from the skin (31, 32). While cucumbers aren’t particularly high in fiber, one cucumber has 2 grams of fiber and half of this is in the peel (33, 34). The kind of fiber found in the peel of fruits and vegetables is generally insoluble fiber. Bottom Line: Fruit and vegetable peels are rich in fiber. Peels provide roughage needed for healthy digestion and preventing constipation. Whole plant foods are the ideal way to get fiber. However, if you are going to eat processed foods, you may as well choose products that are rich in fiber. Some foods — including yogurt, granola bars, cereals and soups — have functional fibers added to them. These are extracted from natural sources and then added to foods as a supplement. Common names you can look for on food labels are inulin and polydextrose. Also, read the nutrition label to see how many grams of fiber are in a serving. Over 2.5 grams per serving is considered a good source, and 5 grams or more is excellent. Bottom Line: When shopping processed foods, check the ingredient list for fiber. Also, check the nutrition label for the grams of fiber per serving. Spread your fiber intake throughout the day. Focus on eating high-fiber foods at each meal, including snacks. Breakfast: Choose a high-fiber cereal or oatmeal and add berries and seeds. Snack: Pair raw vegetables with bean dip or raw fruit with nut butter. Lunch: Have a salad. If you make a sandwich, choose 100% whole-grain bread. Dinner: Add beans and other vegetables to casseroles and stews. Try a variety of cooked whole grains. Bottom Line: Including a higher-fiber food at every meal is one simple way to increase your fiber intake. Fiber is immensely important for your health. By adopting some of the strategies mentioned above, you can increase your fiber intake to optimal amounts.